Very nice compilation on the Mod Club scene in the mid 60's. 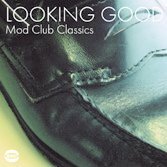 Outstanding tracks from Roger Collins "She's Looking Good", "Keep My Woman Home" Danny White, blistering Stax dance music. Good mix of blues from Junior Wells, Lowell Fulsom and B.B King. The well known soul/blues classic need no praise. I find it strange to include two tracks that were not available at the time however, they do convey the club atmosphere. Compilation and notes by Dean Rudland who lived it. This CD issued by Ace Records on BGP CDBGPD 153.